A FAMILY day at the beach turned into a full blown rescue mission for Angel Wollschlager and her family at the weekend when they came across two beached whales north of Yeppoon. The family came across Hughie Stanley, Teearna Cora and another man while four wheel driving at Nine Mile Beach on Sunday. The trio was trying to push two small whales back into the ocean. Teearna was determined to get the whales back, despite the others being totally spent, Angel said. 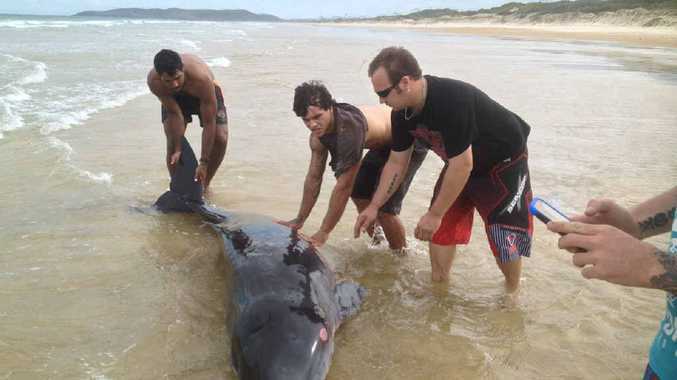 "The two men were about to give up as they had dragged the whales about 500m down the beach but this courageous young girl wasn't giving up until she got the baby whale back in," she said. "It was such a proud moment as we stood and watched these two beautiful mammals swim away together." The families said their congratulations and continued on with their day, but much to Angel and her family's dismay they came across the two whales again. They threw water on their heads and tried to return them to the ocean, however the mother expelled what they assumed was blood, and as the baby wouldn't leave the mother's side they decided to let nature take its course. "The mother looked speared or shot, she had a big round wound. They also looked a bit sick, they seemed to be bloated and discoloured underneath - where their usually white it was like a pinkish colour with blotches," Angel said. "The baby was just cut, it had a big slice across the fin of its tail and under its jaw was pretty badly cut up both cut up and bruised, and the baby couldn't keep itself afloat, I just thought it might have been sick or tired." The family returned home exhausted after being battered by waves. A Department of Environment and Heritage Protection spokesperson said officers went to the beach yesterday morning and confirmed the two whales, measuring 2.5m and 1.5m in length, had died. "At this stage the whale species and cause of death are yet to be determined," the spokesperson said. Marine wildlife strandings should be reported to the RSPCA's stranding hotline, 1300 ANIMAL (1300 264 625).